OK, so, wow, this one is really crazy! We get to see tons of wildlife on our farm because it is quite remote and not near any other homes. So, on this day we were filming a new deer fawn that was bedded right near our home in the woods. We were documenting the all day bed down of the fawn. At one point our cat decided to go and check out the fawn. She has befriended deer in the past and has actually played with deer.. But this time something was different!!! I was filming the interaction of the cat investigating the deer fawn. We even tried calling her back so as to leave the fawn alone, as spooking it would have put it in danger being up on its feet on its own. So, as I filmed this whole interaction there was actually a 5 or 6 foot rat snake that was moving towards the fawn. 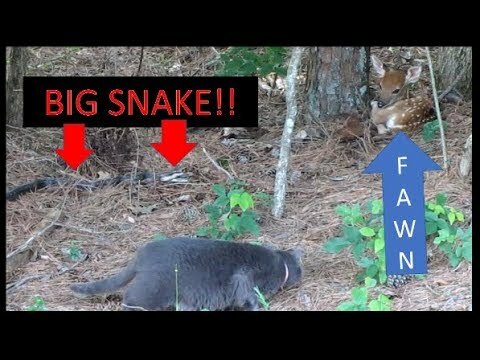 The cat saw this and instinctively tried to intervene and protect the fawn from the huge snake! Grab some popcorn and your favorite beverage because this one is a nail biter. this is ALL REAL LIFE stuff that we document when we see it. Please share this video if you've enjoyed it and like and subscribe to follow all of our country living adventures, wildlife videos, land management, habitat improvements and much more. Kapper Outdoors, living the dream, one acre at a time.